In November, after 11 years at the corner of Madison and Brazee in Oakley, Nest owner Heather Schmidt (below right) moved her thoughtfully stocked gift shop into the former Arte space on Michigan Avenue. With big display windows and a black-and-white tiled floor, the Oakley store evoked Schmidt’s favorite Manhattan brasserie, Balthazar. “The new store is actually smaller, but we’re utilizing it better,” she says. Nest may no longer have the floor tiles, but its abundant charms remain. For your next baby shower gift, pick up a fork and spoon set by Beehive Kitchenware. Handmade in the U.S. from lead-free pewter, the kid-sized sets are adorned with charming little bunnies, chicks, and birds. “I make a real effort to find things that are recycled or made in the U.S.,” says Schmidt, who is also part owner of Studio Vertu, the Over-the-Rhine–based marble tile and coaster manufacturer. True to form, Nest stocks bird-themed enamel transfer-ware serving pieces made by Vermont artist Laura Zindel. And don’t miss Iranian-born Azhand Shokohi’s striking jewelry designs. Shokohi graduated from DAAP in 2002, and uses ribbons, yarn, and found objects to create dramatic necklaces and cuffs. For the second year in a row, Nest will carry calendars featuring Cincinnati dogs. 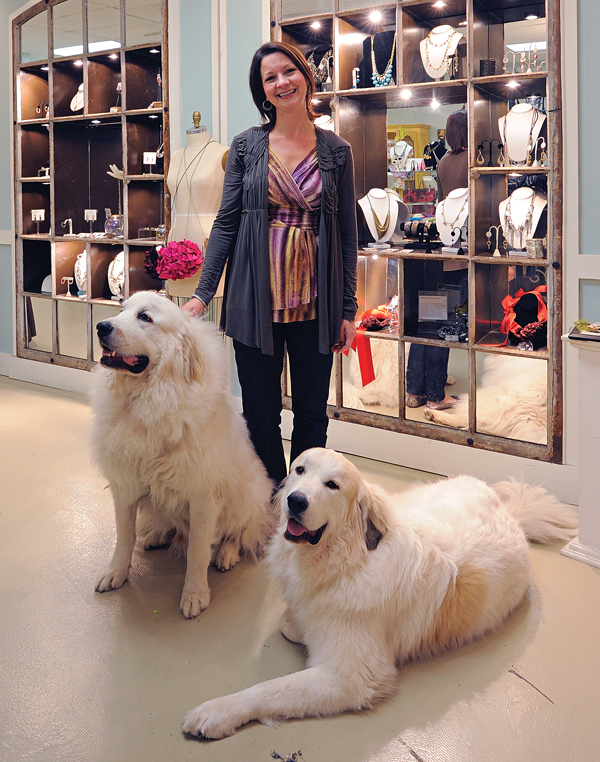 The 2011 calendar (the sale of which benefits the Accelerated Cure Project for MS), features Schmidt’s two gorgeous Great Pyrenees, Matteo and Monte. “They’re the cover boys for March,” she says. Hubba hubba. Originally published in the January 2011 issue.